While it seems a bit daunting, this is actually quite easy to make. It tastes fantastic and you don’t a “lentil” flavor either, as the lentils go in right at the end. I used instant lentils in the meal as that is what I had on hand. You can use regular ones, just cook for time on package. You want about 2 cups or so when cooked. Put the dry ingredients into a large bowl. Chop the butter into small pieces and add in. Using your fingers, quickly work the butter into the flour till crumbly. Add in the milk and mix till just blended (a fork works well). Knock the dough out onto a lightly floured board. Knead the dough for 30 seconds. Pat out to about ½” thick using your palms. Dust with flour as needed to prevent sticking. 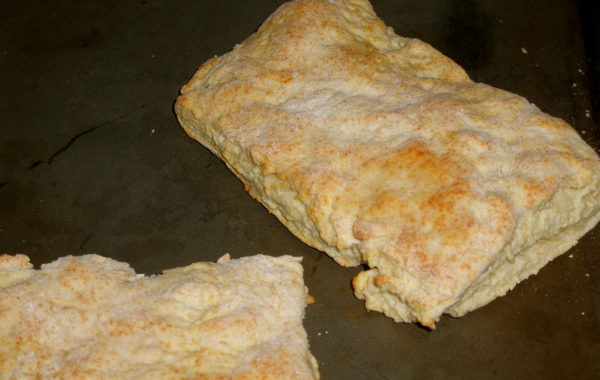 Using a knife or board scraper, cut into 6 biscuits. Place on an ungreased baking sheet. Bake for 10 minutes or until turning golden brown. In a small saucepan bring 2 cups water and the lentils to a boil. Lower the heat and simmer on low for 10 minutes, covered loosely. Drain in a colander when done. In a large non stick pan (with high sides) heat over medium high heat, add in the oil and all of the veggies. Cook for 10 minutes, stirring often. Add in the flour and cook for a minute, then add in the seasonings, stirring well. Slowly add in the milk and stir till well dissolved. Lower the heat to medium and cook till just bubbling and getting thick. Turn off the heat and stir in the dressing, then the drained lentils. 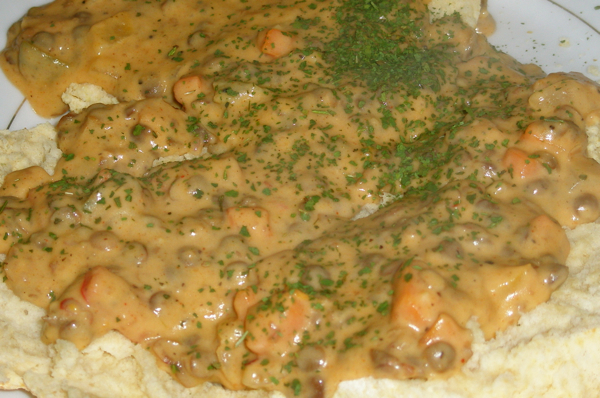 Split the biscuits and top with gravy.